I love the neutrals in this home and the simplicity of it.I hope you do too. 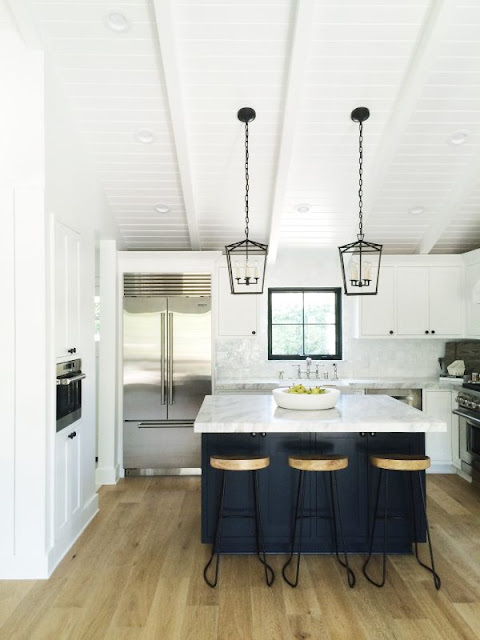 The mix of wood and metal on these stools is key in this design, as well as these pendant lights. Get the look of this dining room with these chairs, and these lanterns. Similar pillow covers and lamps here. You can find a similar end table stool here. The chairs look like Noir to me but I can't find the exact same ones. I love the simplicity of these porch lights and the modern house numbers. I like the idea of putting towels in a round basket like they did here. The rug here is to die for and of course the linen bedding!